We’ve been playing NBA arcade games here at Rocket Chainsaw since Midway’s Arch Rivals which launched in 1989, so when we saw NBA 2K Playgrounds 2 was being made our excitement grew. 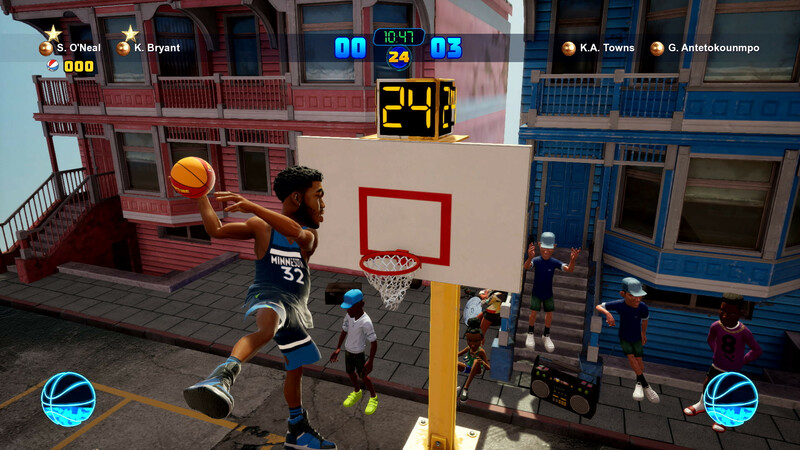 Watching the trailers and seeing the amazing dunks and trick shots was one thing but loading up the game and going through the controls and seeing “B = Push” is what made us very eager to get on the court. Releasing at half the RRP of standard games, NBA 2K Playgrounds 2 could be the fun pastime you’re looking for. The menu screen layout is presented in a fun style that prepares you for the playground atmosphere. You can do a quick exhibition game, season mode, playgrounds championship online, or have an exhibition three-point shootout. The menu is also where you will find where you can create your team and change what they wear depending on what you unlock. When you first boot up NBA 2K Playgrounds 2 you’re given a few free decks of cards which unlock random players. We were lucky enough to get Kevin Durant which helped in the early stages of the game, however all players can level up to become better, so even an average player can technically become as good as Shaq. This is all done through the Get Packs and Card Collection menus which play a large role in how you go about planning your next game. There are two currencies in NBA 2K Playgrounds 2, both which can be earnt within the game, however the golden VC bucks are far more premium and can only be earnt from buying packs of cards using the other currency or from spending real money. The premium cash is used to buy vanity items such as outfits and if you want to unlock the full roster, whereas the currency you earn while you play can be used to unlock random players via the Packs menu or you can purchase individual players. To give you an idea, each game will give you anywhere from 300 to 800 of the basic currency depending on your performance and if you win or lose, and Michael Jordan (and the other elite legends) costs 20,000 to unlock. 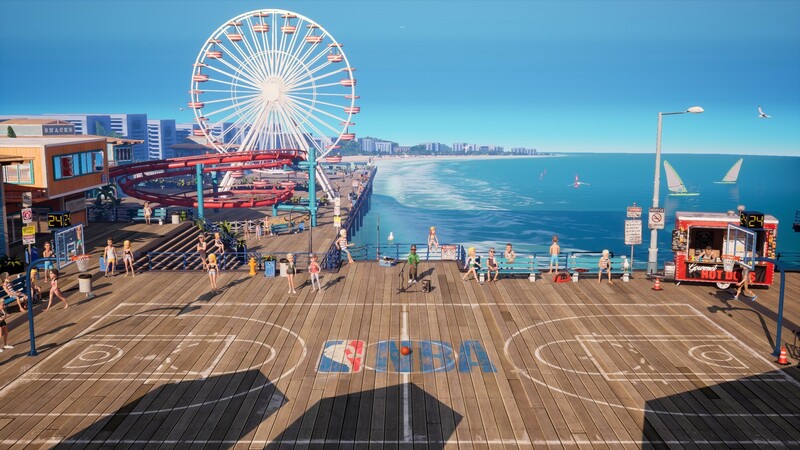 While the core of the game is basketball, there are a bunch of tips and tricks that give you far better chances at performing well in NBA 2K Playgrounds 2. On the defensive, learning how to steal, when to push, and how to rebound or reject are all very important in the fast paced 2-on-2 environment, while being on the offensive is all about timing the most incredible dunks and alley-oops that you’ll ever see. Three-pointers aren’t much of an option for most of the players in the game as the chances of getting them in are so low, but instead the game tends to focus around fast scoring and stealing the ball back. Games have no quarters or halves and are instead just 3-5 minutes long. If scores are level at the end of the game you’ll get 30 seconds of overtime. There are some customisation options, but overall this is an arcade game and therefore the gameplay is limited to an arcade experience. Speaking of arcade, players will find a power-up system known as the Lottery. As you build up your lottery meter by playing well, you will unlock a power-up that will most likely assist you in scoring more easily. It was clear that the Lottery system also had some catch-up features, as when you’re 10 points or more down, you’d tend to get the better power-ups. These range from freezing over your opponent’s ring so they can’t score to getting double points for dunks or 3-pointers (basically the only time you’d try for 3-pointers) to having a maxed out stamina bar for 30 seconds. There are about a dozen different power-ups in the Lottery system and it seemed essential to learn what each one does if you want to be victorious on the more challenging difficulties. NBA Seasons mode is where you will probably spend most of your time in if you’re wanting to level up your players and earn more money. It’s not a full season so you’ll only play about a dozen games before competing in the play-offs and beating the best team from the other side of the country. The rosters in NBA 2K Playgrounds 2 are just as up to date as NBA 2K19 so you’ll compete in the Eastern or Western conference and you still get all of the ladder statistics as you progress. Playing through a season with a player will level them up from bronze to gold too, making it a great way to get your team ready for heading online. Basketball players in NBA 2K Playgrounds 2 are categorized into normal, epic and legend, however each player can be leveled up through a bronze/silver/gold/diamond system. While you can level to gold through normal experience, to unlock the diamond stats you need to complete certain challenges for each player which include both different styles of play and different modes of play i.e. exhibition match, 3-point shoot-out, season, etc. This means you can take a basic player from the Knicks for example and make them better than a LeBron James that hasn’t been leveled up. If you’re wanting to perform better on the harder difficulties or rank up in any of the online modes, then you’re going to want to level up your players and complete the challenges. Jumping online, there are three modes to choose from. 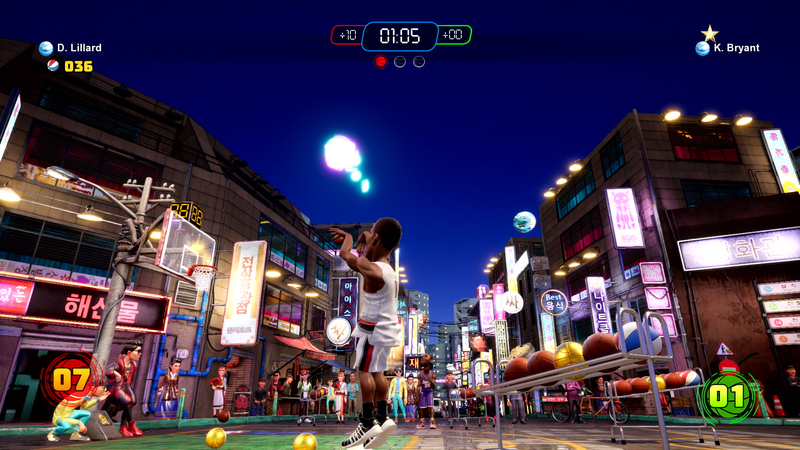 Players can verse each other, work cooperatively, or do an online 3-point shootout. We had mixed experiences online and found sometimes we were unable to find a game, while other times it would connect immediately. Generally, the games weren’t laggy but they do appear to connect you to anyone from around the world, and when we did get lag it was quite hard to co-ordinate an offense, particularly timing alley-oops. 3-point shootouts were a lot more intense online and choosing a player with a higher 3-point stat was required. Commentary in NBA 2K Playgrounds 2 is straight forward and you’ll soon hear the same lines repeatedly. What we did find interesting was they would give a brief bit of NBA history at the start of each game about whichever team you were facing off against, such as the reason the Charlotte Hornets are called the Hornets. Actual gameplay sounds are spot-on, and one can only assume they had access to the audio library of the base NBA 2K games. Some of the different playgrounds have environmental sounds to add some authenticity, and some even proved to be a bit distracting. 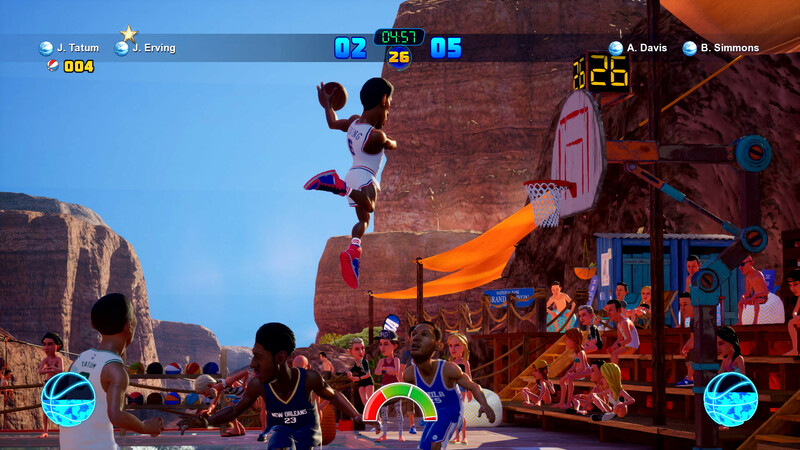 The visuals in NBA 2K Playgrounds 2 have a cartoony theme and focus on insane animations as you perform crazy moves with or without your Lottery power-ups. The players all look kind of goofy, particularly when they’re staring at their team-mate as they run from one end of the court to the other, but Saber Interactive has done well to keep the basic basketball elements looking crisp. 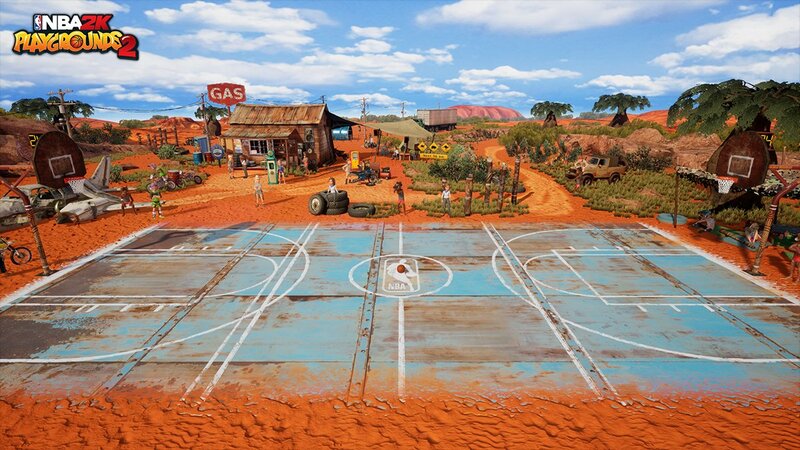 Playground environments on the other hand are a different story, and we’re going to go off on a bit of a tangent here as we discuss the Australian themed court. It was revealed there would be an outback court, so we weren’t surprised to see it in the game, but what we were surprised at was a gas station (not petrol) with an aboriginal man in traditional wear playing catch with a boomerang out the front. There’s also people on dirt bikes with one guy constantly revving his engine, and a sign that tells you to look out for kangaroos, wombats and camels. The whole environment is bizarre and left us wondering if the other international courts such as the Korean and Russian courts were just as stereotypical. Hopefully Playgrounds 3 will give us some more crazy playgrounds such as interspace, or perhaps some tv/movie themed playgrounds that can be more accurate to the context of what they’re trying to achieve. Overall NBA 2K Playgrounds 2 is not going to be a game for everyone. That’s not to say that it’s not an incredibly fun party game that you can load up for some casual gaming, but there are plenty of other options for party games that aren’t quite so specific. NBA fans are more likely to venture to the pro-am courts of the NBA 2K19 neighborhood, and that’s fair enough because the full NBA 2K games have been polling extremely well in the past couple of years if you can get past the microtransactions (read Rocket Chainsaw’s full review of NBA 2K19 here). At $49.95 AUD RRP this game should be one to consider as a gift and also as something to play while you take a break from the big AAA titles that are making their way to our screens over the next couple of months. We also would have liked to have seen some integration and/or cross-play ideas with the main NBA 2K game. The coding of it would most likely be a nightmare, but it would be nice to be able to transfer players or unlocked items between games, or even share your hard-earned money. Rocket Chainsaw reviewed NBA 2K Playgrounds 2 on a PlayStation 4 Pro and it is also available on Xbox One, Nintendo Switch and Windows PC platforms. For more information head to the official website.